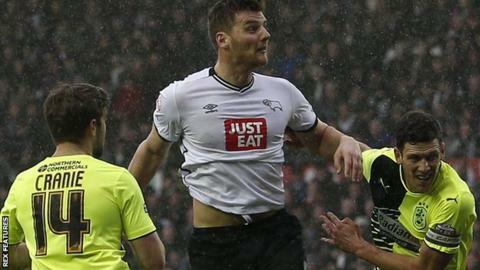 Derby County remain in fifth place in the Championship after a win over Huddersfield. Chris Martin headed the hosts into the lead from Cyrus Christie's cross after Tom Ince had earlier seen a deflected effort hit the Town post. The Terriers had chances to get back in the game but Jamie Paterson dragged a shot just off target from 15 yards. Ince's shot struck the crossbar before sub Johnny Russell wrapped up the victory with a smart curling finish. It was just a third win in 11 matches for the Rams but victory maintains their hopes of pushing for an automatic promotion place. Darren Wassall's men are seven points behind second-placed Middlesbrough having played a game more. Huddersfield were competitive throughout but defeat means they drop to 18th in the table, seven points clear of the relegation zone. The Rams travel to QPR on Tuesday while Huddersfield host Reading, looking for their first win in four matches. Derby head coach Darren Wassall: "We believe in Chris Martin but what we did do at Brentford [on 20 February] was have a long chat before the game and say we wanted him firing on all cylinders because he's a great asset to the club. "He hadn't scored in open play since October so we decided to leave him out for the Brentford game and he agreed with that decision. Since then, I think it was a weight off his shoulders and his attitude was great. "He came on at Brentford and scored a wonder goal and he's not looked back since. That's all we've done, we told him we really rate him as a player and he's responded which is full credit to him." Huddersfield head coach David Wagner: "Derby had to produce one of their best performances today to be able to beat us and so we can leave the stadium with our head up. "I think there were only some small key points that decided this game and those were in Derby's direction which is why we lost. "It's important that you trust and believe in yourself and sometimes you get what you deserve and sometimes not. Today I think we didn't get what we probably deserved, which was a draw or maybe more. Match ends, Derby County 2, Huddersfield Town 0. Second Half ends, Derby County 2, Huddersfield Town 0. Offside, Huddersfield Town. Tommy Smith tries a through ball, but Karim Matmour is caught offside. Attempt missed. Richard Keogh (Derby County) header from the left side of the six yard box misses to the left. Assisted by Chris Martin with a headed pass following a corner. Corner, Derby County. Conceded by Kyle Dempsey. Attempt blocked. Craig Bryson (Derby County) right footed shot from the right side of the box is blocked. Assisted by Cyrus Christie. Corner, Derby County. Conceded by Mark Hudson. Attempt missed. Tom Ince (Derby County) left footed shot from outside the box misses to the right. Assisted by Chris Martin. Substitution, Huddersfield Town. Florent Bojaj replaces Jamie Paterson. Offside, Derby County. Craig Bryson tries a through ball, but Tom Ince is caught offside. Attempt missed. Chris Martin (Derby County) right footed shot from outside the box is too high. Assisted by Jeff Hendrick. Attempt blocked. Chris Martin (Derby County) right footed shot from outside the box is blocked. Assisted by Craig Bryson. Markus Olsson (Derby County) wins a free kick in the defensive half. Attempt missed. Jamie Paterson (Huddersfield Town) right footed shot from outside the box misses to the left. Assisted by Karim Matmour. Corner, Huddersfield Town. Conceded by George Thorne. Attempt blocked. Karim Matmour (Huddersfield Town) right footed shot from outside the box is blocked. Assisted by Nahki Wells with a headed pass. Substitution, Derby County. George Thorne replaces Jamie Hanson. Attempt missed. Karim Matmour (Huddersfield Town) left footed shot from outside the box is too high. Assisted by Jamie Paterson. Goal! Derby County 2, Huddersfield Town 0. Johnny Russell (Derby County) left footed shot from outside the box to the bottom left corner. Assisted by Chris Martin. Tom Ince (Derby County) hits the bar with a right footed shot from outside the box. Assisted by Richard Keogh. Joe Lolley (Huddersfield Town) wins a free kick in the attacking half. Attempt blocked. Johnny Russell (Derby County) left footed shot from outside the box is blocked. Assisted by Chris Martin. Dean Whitehead (Huddersfield Town) wins a free kick on the right wing.